It’s been a busy winter for the FOSS Outreach Program for Women (OPW). On October 13, 2014, seven (yes, seven!) 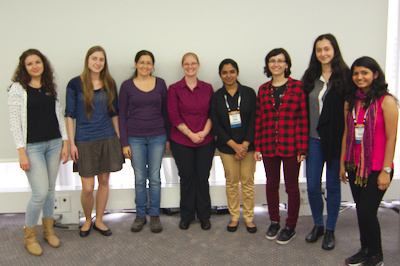 of the former Linux kernel OPW interns presented their projects at LinuxCon Europe. From left to right, the OPW alumni are: Valentina Manea, Kristina Martšenko, Ana Rey, Sarah Sharp (coordinator), Himangi Saraogi, Teodora Băluţă, Andreea-Cristina Bernat, and Rashika Kheria. The OPW presentation room was packed, and I had a couple Linux kernel developers come up to me afterwards and say, “I didn’t realize how complex some of the projects were!” The OPW Linux kernel interns presented their work on Staging IIO drivers, Coccinelle, RCU, removing tree-wide warnings to allow more gcc warnings flags to be turned on, USB over IP, displaying kernel oopses in QR codes, and netfilter tables. Slides are available here. I’d like to thank the Linux Foundation for covering additional travel costs for several of the interns. I would also like to thank the internship sponsors, Intel, Linux Foundation, Linaro, and Codethink. Finally, this year’s internships could not have been possible without the time volunteered by our Linux kernel mentors: Adrian Chadd, Bob Copeland, Andy Grover, Nick Kossifidis, Greg Kroah-Hartman, Paul McKinney, Pablo Neira, Julia LaWall, Rik van Riel, Luis R. Rodriguez, Josh Triplett, and Peter Waskiewicz Jr.
Iulia Manda will work with Josh Triplett on kernel tinification. Tina Ruchandan will work with Arnd Bergmann on fixing the kernel subsystems that still have issues with 32-bit timer wrap in 2038. Tapasweni Patha will work with Julia Lawall and Nicolas Palix on using Coccinelle to track the increase of common bug patterns since a whitepaper was published in 2011. Roberta Dobresc will work with Octavian Purdila and Daniel Baluta on migrating Staging IIO drivers to use the kernel’s I/O APIs. Ebru Akagundu will work with Rik van Riel on improving transparent huge page swap performance. I would like to thank the sponsors for this round: Intel, Codethink, and Samsung. Without their funding, it would not be possible to pay the OPW interns for their hard work. The OPW Linux kernel internships have been a great success. So it is with mixed, bittersweet feelings that I announce I will be stepping down as the coordinator for the Linux kernel OPW internships. The program is running smoothly, and I find joy every day in watching the OPW Linux kernel interns learn and grow. However, I am no longer a part of the Linux kernel community. Julia Lawall, the maintainer of Coccinelle, will be stepping into the role of OPW kernel coordinator. Fortunately, I’m not leaving the OPW program altogether. I’ve agreed to step up to help Marina Zhurakhinskaya and Karen Sandler coordinate the larger OPW program, and I will be there to help Julia when she takes over as kernel coordinator in February 2015. I am proud to have jump-started the effort to make the Linux kernel community more diverse by providing a pipeline for women to get involved in Linux kernel development. With the help of mentors and sponsors, we’re slowly increasing the diversity of the Linux kernel community. Four of the eleven OPW interns from the first year the kernel participated in OPW have gotten jobs as Linux kernel developers. We’re not only improving the community for women developers. We’re helping all newcomers by creating detailed tutorials on how to make your first Linux kernel patch and sharing tips for how to break into open source development culture. OPW is encouraging Linux kernel developers to think about mentorship and sharing their todo lists, which can only help newcomers find larger kernel projects to tackle. Diversity efforts improve communities for everyone. For the past year and a half, the Linux kernel has participated as a project under the FOSS Outreach Program for Women (OPW). OPW provides a three month paid internship for women (cis and trans) and genderqueer or genderfluid people. After a month-long application process, the selected OPW interns are paired with an open source mentor to work on a project. As of August 2014, there are eleven Linux kernel OPW alumni, and five interns that are just finishing up their internships. The sheer number of patches the OPW kernel interns and alumni have created is impressive. They’ve been in the LWN top kernel contributor statistics since the program started in the 3.11 kernel, and they continue to be a top contributor despite the lack of published data for the 3.15 and 3.16 kernels. Making it over the thousand patch mark is a cause to celebrate. More importantly, the OPW kernel interns and alumni have deleted six times more code than they added. They’re deleting dead code and unused drivers, and thus removing bugs from the Linux kernel. The statistics from the code development efforts from the OPW kernel interns and alumni are impressive. However, contributing to open source isn’t just about writing code. It’s about interacting on mailing lists, reviewing code, writing documentation, answering questions, working on graphical design, maintaining project websites, and so much more. The main goal of the OPW internship program is to create a long-term relationship between the mentee, the mentor, and their open source community, in order encourage minorities to continue to contribute to open source. How are we progressing towards the goal of creating more women kernel developers? Are the women who complete OPW kernel internships continuing to work on open source projects after their internship ends? Do they find jobs where they can be paid to work on open source? In order to measure this, I created a longitudinal study to measure open source contributions of OPW alumni. I’ll send out the survey every 6 to 12 months, and compare the results of the program over time. The most recent survey results from our eleven Linux Kernel OPW alumni shows the program is successful at encouraging women to continue to participate in open source. At least monthly, OPW alumni are engaging and contributing to open source communities. Most of them participate through code submission, testing, and discussion on mailing lists, IRC, or forums. However, it’s interesting to note that a few of the OPW alumni have stepped into open source leadership positions, either by reviewing contributions, maintaining a project, or by managing a team of open source contributors. Another exciting result of OPW is that some of the kernel OPW alumni are getting paid to work as Linux Kernel developers. Teodora Băluţă is working on Android kernel drivers for Intel’s Open Source Technology Center. Lisa Nguyen is working for Linaro on ARM power management. Lidza Louina is a kernel developer at Oracle. Xenia Ragiadakou also works on Linux kernel power tuning at OnApp. Elena Ufimtseva isn’t being paid to work on the Linux kernel, but she is working on a proprietary project at Citrix. I’m overjoyed that these women have found jobs in the technology sector, and so many of them are paid to work as Linux kernel developers. This fact is heartening to me because some of the women that participated in OPW were working in retail before their internship. To be able to move into the technology sector or be hired as a Linux kernel developer is a giant step in the right direction, and I’m happy that the OPW program could be a part of that. It’s exciting to see five of the eleven OPW kernel alumni get jobs in the technology sector. Four of the kernel OPW kernel alumni are still working their way through Bachelor’s or Master’s degrees. Two OPW kernel alumni are actively looking for jobs. If you need to hire a junior kernel developer, please email the opening to sarah dot a dot sharp at intel dot com, and I will pass the job description onto our OPW alumni. If you’re interested in applying to be an OPW intern, you can find more information on how to apply on the OPW homepage, and on the OPW kernel project page. Please note that you do not have to be a student to apply to OPW. The only requirement is that you’re able to work full-time during the internship period, and that you are a woman (cis or trans), or a genderqueer or genderfluid individual. This round, we’re also running a pilot to explore opening up the project to other under-represented minorities in tech, by allowing alumni from the Ascend Project to apply. If the pilot is successful, we’ll be able to expand OPW to encourage chronically underemployed, LGBTQ, Latin@, and African American populations to participate in open source. A month ago, Amanda McPherson and Greg Kroah-Hartman from the Linux Foundation asked me to coordinate an internship program aimed at getting more women to participate in the Linux kernel. In order to be considered for an internship, the applicants need to submit patches to the Linux kernel, and get them accepted. 41 women applied for 6 Linux kernel internships. In 13 days, 374 patches were submitted, and 137 patches were accepted. Want a summer internship working on the Linux kernel? Internships are available for women and genderqueer/genderfluid people for summer 2013, from June to September. They come with a $5,000 stipend. We have some pretty awesome projects and helpful mentors, so please apply to the FOSS Outreach for Women (OPW) page. Please complete your initial application by May 1st. We’re still working on some details, so you’ll be able to update your application until May 17th. Please share this with any of your friends that might be interested! Update: If you’re interested in being a mentor for kernel interns in any capacity, or helping review applications or documentations, please let me know. My email is in MAINTAINERS.